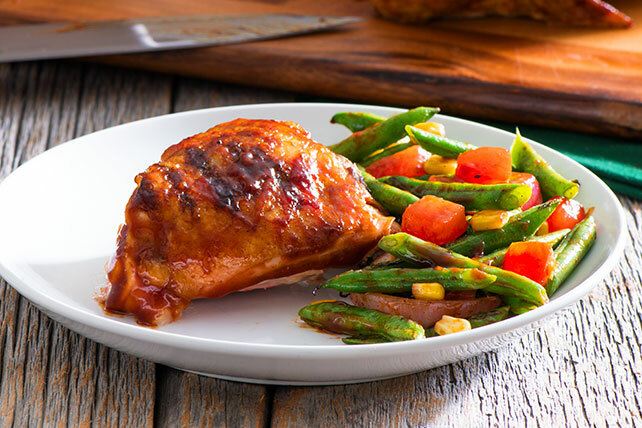 Treat your family to Spatchcock BBQ Chicken with Green Bean Salad. This spatchcock BBQ chicken is complemented perfectly by a grilled green bean salad. Place chicken, breast side down, on cutting board with legs toward you. Use kitchen shears to cut along each side of backbone; remove and discard bone. Open up chicken like a book; turn over. Press firmly between breasts to flatten. Reserve 2 Tbsp. oil for later use; brush remaining oil, then rub 2 tsp. paprika evenly onto both sides of chicken. Place chicken, breast side down, on grill grate; top with weight. (See tip.) Grill 5 min. Remove weight; turn chicken. Grill (without weight) 35 min. or until chicken is done. Brush chicken with 1/2 cup barbecue sauce; grill 5 min. Remove from grill, brush with 1/4 cup of the remaining barbecue sauce. Cover with foil to keep warm. Toss beans and onions with remaining oil and paprika in disposable foil pan sprayed with cooking spray. Grill 5 min. or until vegetables are crisp-tender. Remove from grill. Cut beans and onions in half; place in medium bowl. Add remaining ingredients, including remaining barbecue sauce; mix lightly. Serve with chicken. Wrap brick in foil, then use to weigh down the chicken as it cooks on the grill.